Dwindling workforces, coupled with the comparative decrease in the demand for accommodation are the key reasons behind the price drops in Karratha and cities such as Perth and Darwin. So why won’t other major cities suffer similar price drops? Simple; the major city markets are driven by different dynamics which pre-date the mining boom. The dramatic price rises experienced in Sydney and Melbourne over the past few years were largely the result of favourable interest rates, with both cities having experienced previous high-growth levels, pre-boom. Property prices in mining towns surged thanks to a population influx that flowed from the mining boom which is now reversing, with Perth and Darwin also being affected, but to a lesser degree. It is important to trust the fundamentals of property investment. If it doesn’t pass the “lifestyle test” and if there’s no jobs out there and the economy falters, guess what? You’ve got a ghost town. Investing in areas which will always have strong demand, regardless of booms and busts, is a much safer move. For the latest property market information, visit the Naked Real Estate blogs. 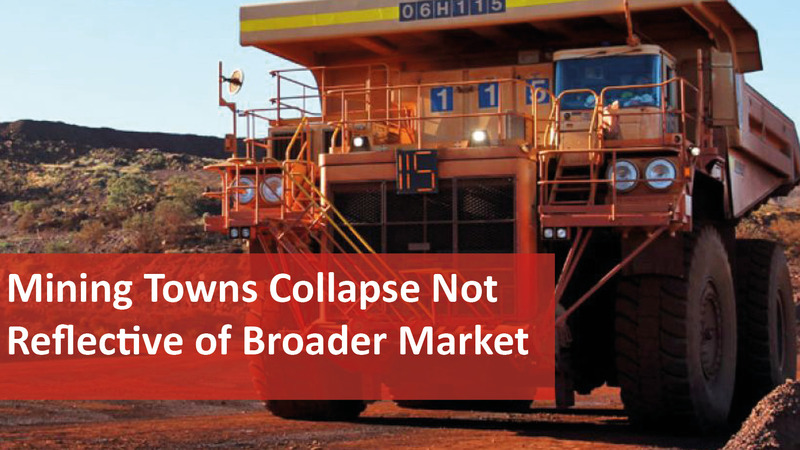 With the recent performance of mining towns heading in the same direction as the iron ore prices, it is important to view this as an isolated incident and not indicative of the wider Australian property market.